Erica was making dinner last night and said, “make me a cocktail. Something fancy.” So I went over to the (overflowing) liquor cabinet and tried to see what might be fancy. I noticed a bottle of limoncello that one of our cruise-ship working friends had brought back from a tour of the Mediterranean and that we had never even cracked. That sent me to my old standby, the Cocktails+ app on my iPhone (and… I was going to link to it, but evidentially it’s no longer for sale.) A great feature of the app is that I can just type in an ingredient and see what cocktails include it. Cocktails+ only had three results for limoncello: one was a coffee and one required mint leaf, which I didn’t have. 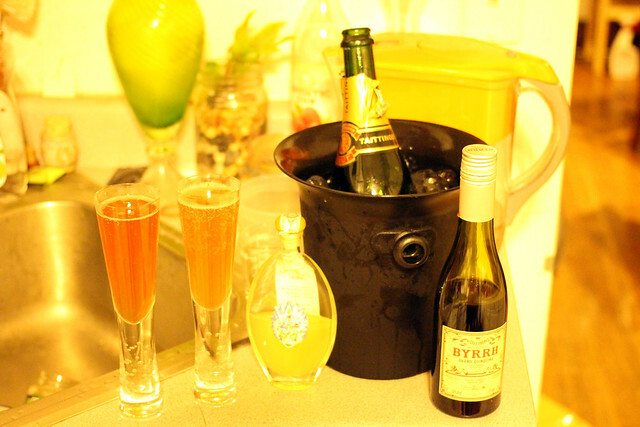 The third had just three ingredients: limoncello, Prosecco, and Carpano Punt e Mes. I knew I had a bottle of champagne that I could substitute in for the Prosecco, so I click on Carpano Punt e Mes to see what it was. “Proprietary Italian quinquina…”. Well, that was a coincidence—in the new season of Drunk Monkeys, the ladies try Byrrh, a quinquina, and now we had this bottle sitting around that otherwise I’d have no idea what we were going to do with. I mixed us up a couple of Tulio Oros and I have to say they were quite tasty. The champagne was a little old, and maybe a hair bitter on it’s own, but the limoncello and Byrrh covered that up nicely. It was also a very strong drink and maybe we were a little slow getting some of our after-dinner chores done. But fancy, check. Fill with 6 oz Prosecco. From Cocktails+, Adapted from Gary Regan, The Joy of Mixology.